UPDATED : W/PICTURES Extruder chewing up the pla. Constantly. Posted February 7, 2013 · UPDATED : W/PICTURES Extruder chewing up the pla. Constantly. I have the new extruder that was included with my ultimaker. after a few issues in the beginning i have taken it apart. cleaned the living hell out of it only to find it is STILL chewing up the pla,. i have screwed it loose.. tight and everything in between but every 10 minutes i have to manually go back adjust it and forcefully push the pla through because its no gripping properly. AGAIN - i have tried everything from tight to loose and everything in between. i have tried cleaning the pla. so far 9 projects have been wasted along with about 30 meters of pla. i have had nothing but issues with this machine on a daily basis. even down to cura as well and i've just about had enough of this machine. pm me if you would like to buy it at a massive discounted price. 1) it could be a problem at the hot end that is making the extruder work too hard. What temperature are you printing at? When grinding occurs, can you manually push the filament through the tube fairly easily? 2) have you checked the diameter of your filament? Does it slide trough the tube easily when pushed by hand. 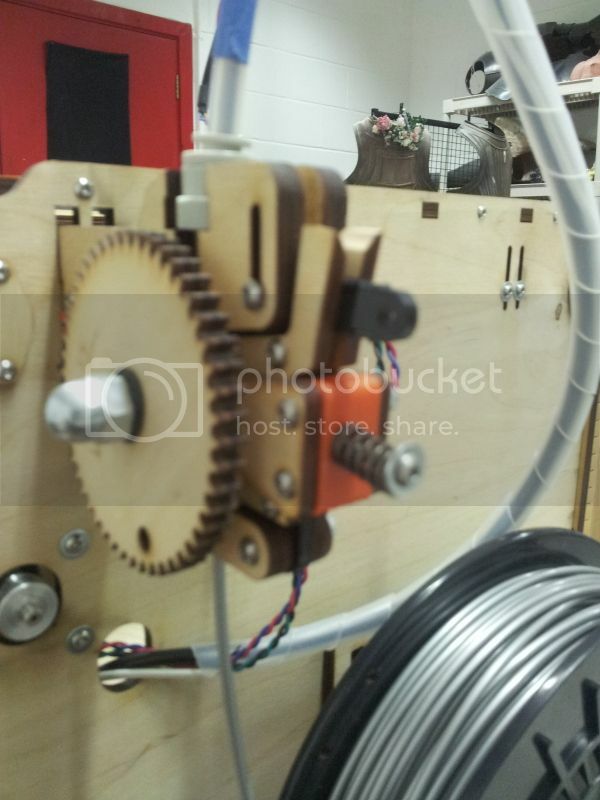 3) could you post some photos of your extruder, open and closed so folks can see if anything looks wrong? been printing at a slow speed. temp 220*. have pushed the temp up to 235* same issue. the grind wheel is eating it. theres dusted filament in the tube. which i have to Keep cleaning - again i have adjusted the tension. filament sides easily through the tube with no issues. This is an on going issue that keep happening as a constant and honestly i'm sick of it. will post pics later on one i go back to the printer as i have a sledge hammer to hand and yes, it has gone through my mind. Posted February 8, 2013 · UPDATED : W/PICTURES Extruder chewing up the pla. Constantly. There could be something burned up inside the nozzle causing a partial blockage, trying printing at 260C (yes, this is extreme for PLA, and might smell a bit) printing at 260C usually cleans up the nozzle very well and removes any partial blockage that could be in there. i will be posting pictures later. The extruder cross hatched sectionis chewing the PLA. 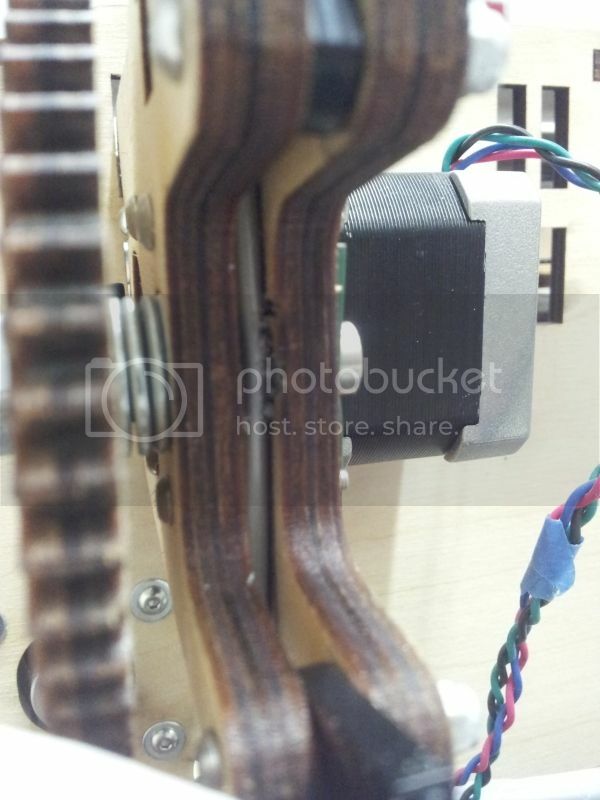 The chewed PLA has worn down the extruder housing causing LUMPS of the wood to break off. I can only assume a lump of wood has traveled down into the nozzle because at 260* i have struggling to force the PLA through manually. This is my mind is a design flaw for the material used for the extruder. how easy is it to remove the nozzle and clean it out? Care to take some pictures? Of your hotend and the extruder? Posted February 9, 2013 · UPDATED : W/PICTURES Extruder chewing up the pla. Constantly. If you have a hot end v2, which i assume, you can also check if the filament can pass through your teflon tube. The white tube that holds your bowden tube in your print head. Printing at high temperatures (and with retraction).. (and slow speed), heath can crawl up via the filament, soften your teflon tube. With the pressure from the bowden tube it can be squeezed just a very small amount, but maybe just enough to cause extra friction for your filament. Yes... the extruder bolt will chew into the pla if it keeps turning and, for whatever reason, the filament doesn't move. This could be due to blockage at the hot end, or something about the extruder drive mechanics. PLA is pretty soft really... 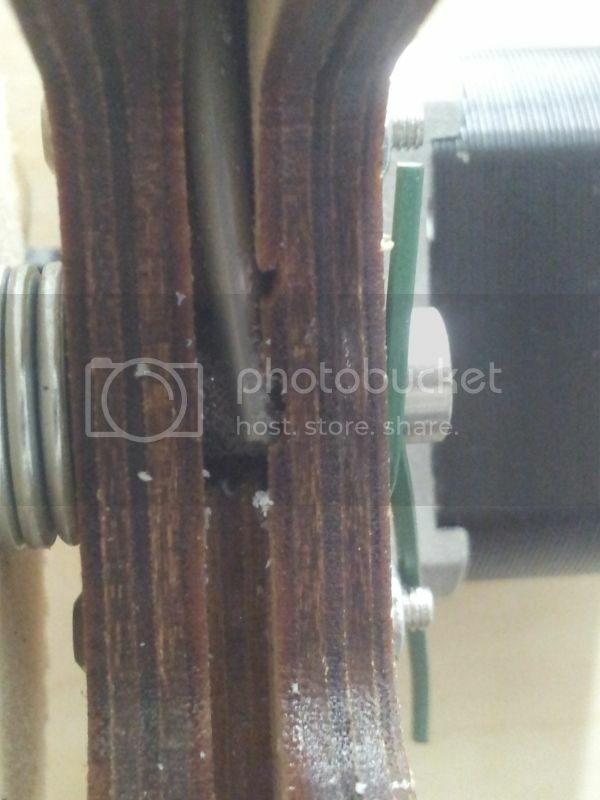 I'd be interested to see this damage to the wood of the extruder mechanism. Removing the nozzle is pretty straightforward - it's just screwed into place. You just need to be sure to heat it up to soften any plastic in it or on its threads. And then unscrew the nozzle carefully. It's just a metal tube with a hole in the end, so its fairly simple to remove and replace. I'd be inclined to heat it up to 250º or 260º to try and flush through any PLA before you start, and then once you take it off you will be able to so whether there is anything blocking the nozzle chamber. Posted March 7, 2013 · UPDATED : W/PICTURES Extruder chewing up the pla. Constantly. I was having similar problems early on. I had to change the washers on the knurled filament drive shaft around from the way the instructions said to do it. I had to put more washers on one side of the large gear than on the other side. On mine, the shaft had to be contacting the filament at a specific point which was closer to one end of the shaft. This made the black clip difficult to attach, but I finally got it to stay on long enough to make my own thinner replacement clip which fit perfectly. After I got the shaft positioned perfectly to the filament, I completely loosened the spring screw and started up a print. I turned the screw slightly (1/4 turn) and then checked to see if the filament was moving. I repeated this until the filament started moving. Then, I gave it one more quarter turn and stopped messing with it. Another contributing factor was that my original nozzle had a metal bur just inside the tiny hole. I didn't see this until later and only under a magnifying glass. I had already replaced the nozzle, so it didn't matter by that time. So, you might check for that also. Posted March 9, 2013 · UPDATED : W/PICTURES Extruder chewing up the pla. Constantly. I was having similar problems early on. I had to change the washers on the knurled filament drive shaft around from the way the instructions said to do it. I had to put more washers on one side of the large gear than on the other side. The deepest knurling is away from the big gear on the hobbed bolt. 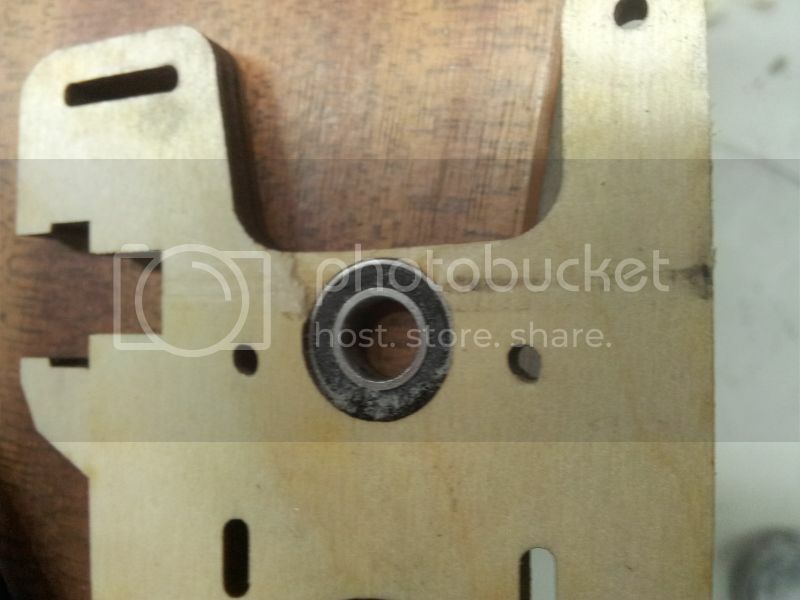 I used more washers and also turned the slot for the clip from 2mm wide to 4mm wide to permit a shift of the hobbed bolt. I would send links to the photos, because I spent considerable energy documenting many hardware tips with both extensive text and photos in the last forum but the photos are gone and the old forum is gone! :( The threads are nearly worthless without the photos. Guess I'm not doing that again! 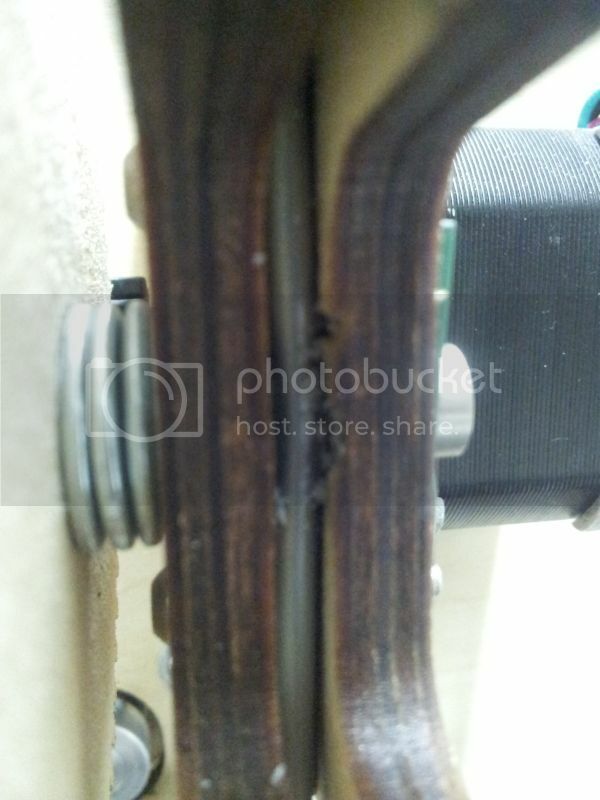 Posted March 10, 2013 · UPDATED : W/PICTURES Extruder chewing up the pla. Constantly. This new forum tells me my photo capacity has been reached and I haven't posted a single picture on here. I think there is something wrong with photo attachments in the new forum. Please forgive my lack of updates and replies. I have cleaned this pile of scraps with everything but my tongue. 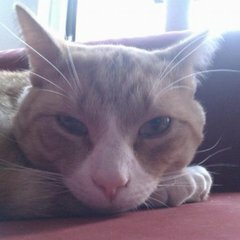 i have taken pictures but i took my UM and locked it inside a box otherwsie i was going to destroy it. I can honestly say my mental sanity and stress levels have been pushed to the brink with this ill designed machine. To i'm gonna forward this same message to support as well with all the follow brief pieces along with linked images. YES. i have cleaned everything. YES i have pushed the head up to 265 and watched the PLA flow like gravy. YES and the teflon tube. YES my PLA was bought form UM. 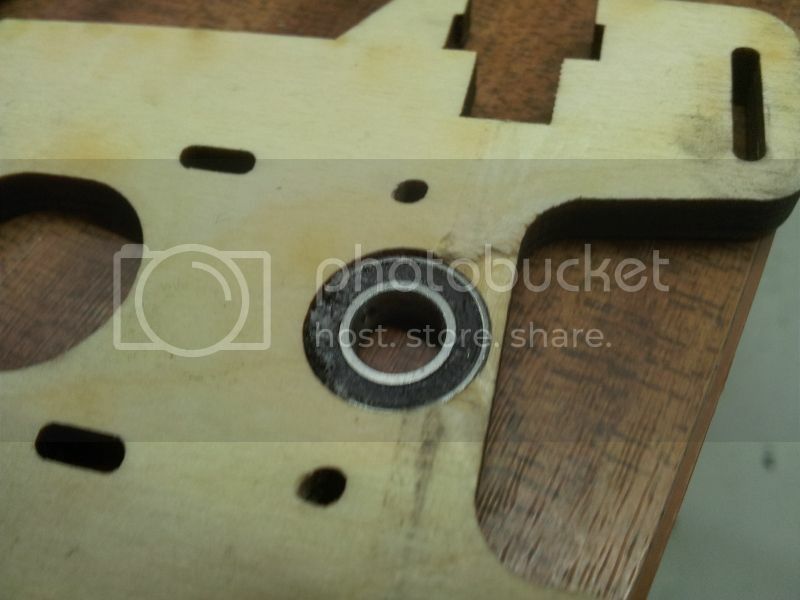 To start with the "chewing" of the PLA caused the ply wood housing to be chipped away. see photo. This was sanded down and cleaned. The teflon tube was carefully cleaned out. The extruder housing including bolts, washers, screwing, motor, gears and screws were all cleaned. This problem is now wasting my PLA, my time and money. if any parts need replacing i will be expecting UM to replace them. as this is a design flaw. not human error. Metal grinding on plastic... Not the best idea admittedly. After mass cleaning. i was able to print 1, item. second item.. Mass chewing and i will be forced to repeat all of the above. I'm honestly So sick of this machine the extruber design does NOT work correctly. Or please make me an offer on this over sized door stop. the extruder can fail in 2 ways. 1) You can have not enough pressure on the wheel, which will result in not enough force to force plastic through the hotend. This will mean the knurled wheel will sit there chewing the PLA away. 2) You can have a hotend plug (either PLA, or other debris), this will cause excessive force needed to push the filament through the nozzle, which means even when adjusted perfectly you will grind PLA away. (the knurling on the bolt is not very well manufactured, and IS worth sorting out by correctly spacing the shaft, BUT I dont regard this as being capable of the kind of show-stopper issue you are having). I might sound like a broken record here, but I regard almost any hotend without active cooling as being at best just a bad design that some people "get away with" due to their particular choice of print materials, slicer software and so on. For example ABS is supposed to be less succeptibe than PLA to plugs, using retraction makes it worse, very long prints make it worse, leaving the printer sitting idle with the hotend heated is almost certain death. These symptoms were it seems considerably improved after the V2 hotend was introduced. But I remain personally very sceptical that they are fixed completely, as there are a few people posting with issues like yours from time to time. The extruder WILL be fine, I will put money on you having a hotend plug. Perhaps this started slowly and then maybe later with the grinding some wood part or something has jammed it properly - but it all comes back to plugs forming. I have moaned at great depth about active cooling and plugs etc etc for ages before so will not type it ALL again. However I would recommend you fit a fan to your hotend (which for me fixed all these kinds of problems permanently). All details + STLs + photos available on my website. hotend, you must heat the whole assembly up first or you will snap the brass nozzle off during dissasembly. Too much pressure = chewed pla. too little.. and no flow. but the hot end isn't plugged, i've cleaned it out too many times, its the knurling bolt, Metal on plastic is just too much.. I'm searching the Thingiverse for other designs because i'm positive this knurling bolt is the problem. Are you sure about the 3 washers, standard is one, which isnt enough, I have 2. Posted March 11, 2013 · UPDATED : W/PICTURES Extruder chewing up the pla. Constantly. I've noticed on this picture that the screw in the wheel that turns against the PLA seems to be pretty tight. Are you sure that the wheel (look at the picture I attached, where my thumb is) is rotating freely? I'm seeing 3 washer and then there is still room between the big gear and the side of the feeder. This could indicate that you are feeding on the wrong part of the bolt. I'm also not seeing the stock black piece holding the bold, but something green. The chipped would doesn't cause it. My machine at home is missing a few more bits there. No problems on it. 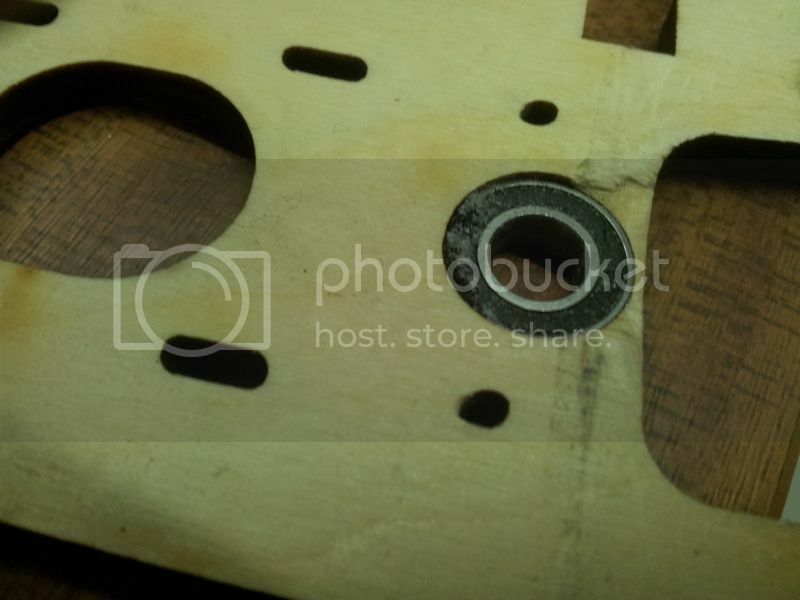 I could be wrong, but I am seeing crushed plywood, indicating that you used the knurled M8 bolt to really tighten the space to a point where you damaged the wood, and possibly the bearings. the bolt assembly should be somewhat loose, and easy to move, and certainly not restricted from the sides. @Daid At the time of purchase/construction the new extruder had only just been introduced into the kits. - During the time the Wiki instructions had not been updated in quite some time. Because of this i was unaware that the Black Stock clip wasmissing from my kit. - Nice to be upgraded but the lacking updates made this machine very stressful to construct. The instructions for the m3 bolt were followed to the letter. Unless of course this also was due to misinformation proved by the Wiki. The green piece is a wire thats been greased to act as the spacer clip. If there was/is a problem with the boden tube, given how much chewed up pls has traveled thorugh it i doubt thats help the inner structure. With regards to the wood, i did think it possible dust.shards would be carried up and through to the nozzle. The V3 bolt was introduced a year ago. And I'm pretty sure those instructions for it where in place for quite a while already. The drive upgrade was a bit of a mess on the wiki. But the bolt instructions where there. @Daid While the boltmay well have been introduced, i can assure you i made the lack of instructions reguarding certain parts was made Very clear to Ultimaking Ltd. There is only a 2D lasercut drawing of the clip. So if you want to print it you'll have to turn that into a 3D shape. Ok. i have spent the last few hours changing the feeder to match the pictures from the (finally) undated instructions. i have yet again cleaned out the nozzle. Print started well.. back to chewed up pla which has ruined my 18th print in a row. i can't get clear pictures of the tube but when clean there does not appear to be scratches or issues. I am offically at a loss. i no longer know what to do and no ones bothered to get back to me from customer support still. I can honestly say this is the single most stressful machine i have ever purchased. Posted March 12, 2013 · UPDATED : W/PICTURES Extruder chewing up the pla. Constantly. You will not be able to print anything sucessully with a bit of wire securing the drive bolt. Your drive bolt is shifted too far to the right (3 washers is too many) and its basically a waste of time doing anything before you sort that out. As before, please post a picture of your drive bolt alignment so I can see the position of the knurling. If the extruder is not assembled with the right parts it will not work. There is no point trying to print things with a bit of green wire keeping your drive bolt in place. I dont know if you replaced that since your last attempt. I can email you an STL of the clip which you can print (its so small you can probably keep it together for 20mins to print it) or you can wait for the correct part to arrive from UMaker. Its extremely difficult for us on the forum to diagnose anything without a picture, so although its probably the last thing you feel like doing, please take photographs and post them at each stage of your efforts...or its just guesswork for us. Hope this helps, it will work eventually !